May 1, 2012 Adri H.
Yesterday, April 30th, was Queen's Day here in the Netherlands, and the color of the day was definitely and resoundingly ORANGE resulting in a personal color challenge. The day before, I skimmed through my closet and found not a single orange thing. Not one! I used to have an orange shirt from my University of Miami days (school colors: green and orange), but I guess I deemed the shirt too short and gave it away. I fell asleep with the thought that I still might find the orange shirt, but I didn't. So, I found myself on Koninginnedag sans the famous color. I brainstormed... looked in my fabric stash and yarn stash and found a couple of contenders in the fabric section, but they were either too peachy or not a good solid orange color! The yarn stash fared a bit better. 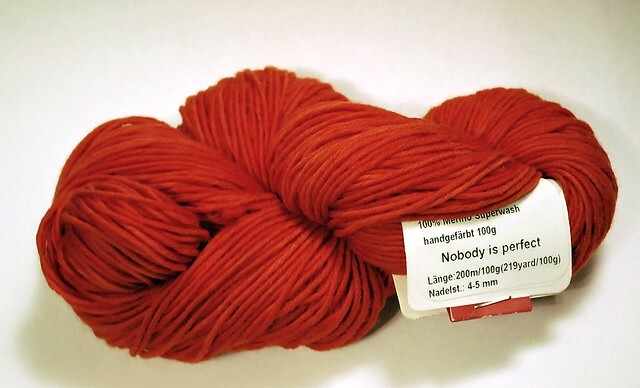 I found the remnants of a skein of Wollmeise's limited production worsted weight yarn "Molly" in a razzle-dazzle orange. I found my winner. So, I quickly (2 hours is quick for me!) knit an orange headband. Using garter stitch for the underside, and a lace pattern I've been playing with for an upcoming shawl as the main motif, out came this wild orange headband! I really like the color. It suited the occasion perfectly. Happy Queen's Day, everyone!